Dahlia: Bright, bold and beautiful dahlias! Dahlias make a colorful botanical painting. I painted these red dahlias using flowers from the garden as reference. 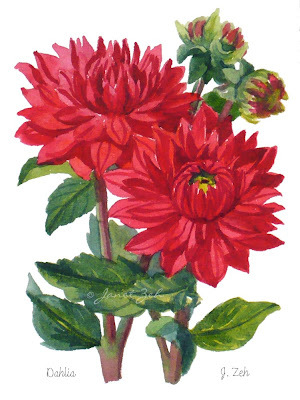 Red Dahlias Botanical print comes in several sizes and may be ordered framed, unframed or on canvas. Click the Order Print button below for sizes, options and prices.